The top cop was questioned by the investigative agency's sleuths for over eight hours on Saturday over the Supreme Court order. Former Kolkata Police Commissioner Rajeev Kumar. 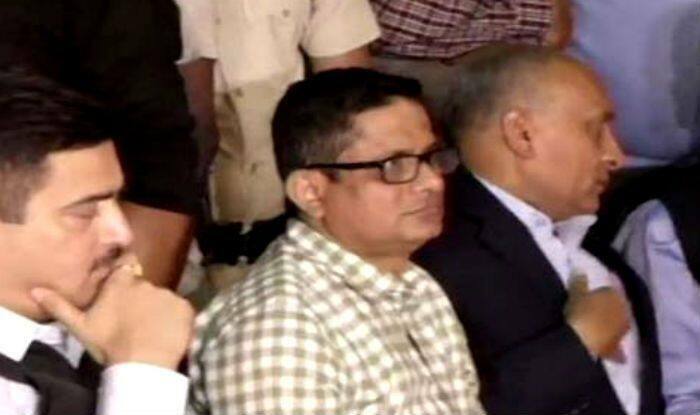 Shillong: Kolkata Police Commissioner Rajeev Kumar will appear before the Central Bureau of Investigation (CBI) in Shillong for the second day in a row on Sunday in connection with the Saradha chit fund scam and other ponzi scheme cases. The 1989-batch IPS officer was questioned by the investigative agency’s sleuths for over eight hours on Saturday over the Supreme Court order. Besides, the probe agency has also summoned former Trinamool Congress (TMC) MP Kunal Ghosh to appear before it at 10 AM on Sunday, February 10. If reports are to be believed, the CBI may confront Kumar with Ghosh. “Ghosh has on several occasions claimed that Kumar had tried to influence the SIT investigation by West Bengal government. We may make Ghosh and Kumar sit face to face for questioning today,” a CBI officer told PTI on the condition of anonymity. However, a final call will be taken by the investigation officer who is present in Shillong. The CBI, for investigation, is relying on a 91-page letter from Ghosh to the Enforcement Directorate (ED) which spoke about the role of Kumar in handling the ponzi scam probe after the main accused Sudipta Sen and Debjani Mukherjee, both promoters of Saradha group of companies, had fled to Kashmir, from where they were arrested in 2013. Meanwhile, sources close to Zee News have revealed that the Kolkata police chief has insisted on video recording of the questioning by the CBI on Sunday’ so that no allegations surface against him that he did not cooperate’. An officer close to him, as quoted by the media report, claimed that the entire proceedings of Saturday was also video recorded on his request. The Kolkata Police commissioner had arrived in the capital city of Meghalaya on Friday along with his lawyer Biswajit Deb and two other IPS officers. The Supreme Court had, on Tuesday, directed Kumar to appear before the CBI in Shillong in connection with the two scams. However, the court had also said that the CBI cannot arrest Kumar.